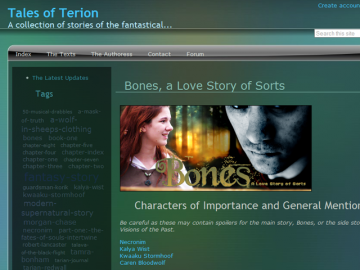 BONES is an online novel updated every other Sunday. Originally based in the Warcraft universe, it has since expanded into it's own. Our tale follows the path of two of our main characters: Necronim, an undead rogue haunted by his past, and Kalya Wist, the human girl who helped him once. Their story is many things but it is most especially one thing - a love story between two people who can never be together. Bones has not been tagged yet. Help others find Bones by tagging it! Bones has not been reviewed yet. Bones has not been recommended yet.